Following our previous article spelling out the importance of Bag It and Bin It compliance on Magog Down, here's the report on the Big Scoop initiative. "We split into two groups, and set off up either side of the big field, until we met at the middle gate to compare the enormous amount of poo we had collected. Then back to base. "In the afternoon, two more dog walkers completed the procedure on the bottom loop, so that all paths had been covered and cleared. 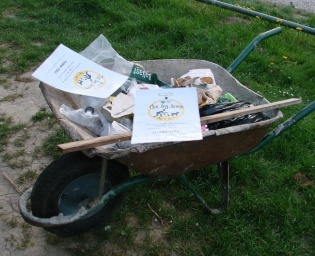 They then added their collections to ours in the wheelbarrow which Bill French had kindly provided. This was on show on the corner near the dog field to the right as you enter the site, for several days including over the Easter weekend, with an explanatory leaflet explaining our actions and the resulting mound of excrement in the barrow. "There is no need for volunteers to do this if you clear up after YOUR dog. Please do, for the sake of all dog owners who use and love this wonderful place, so that we can continue to walk here for years to come." We echo Helene's words, and also once again express our thanks to all those who DO bag up and use the bins provided - the weekly kerbside collection of several large black bin bags of what our contractor has emptied from these bins is testament to the fact that those who do not pick up are indeed very much a minority. To read why "Stick and Flick" is not appropriate here, see our previous article.